It has been five now weeks since the “Getting Started” article was published and it has been 3 weeks since the 2 week update was posted. I had intended to provide this next hunting fitness update last week but time just did not allow it. So I plan to keep this update pretty short and to the point. Regarding my diet, nothing has really changed. I am trying to keep my maximum caloric intake between 1500 and 1800 calories per day. I am doing this by eating a lot of chicken, fish and meats and almost always preparing these on the grill. I combine this with veggies, usually green beans, green peas and various beans like Black beans. No breads, no potatoes, no pastas. I do eat some rice from time to time but this is always brown rice, wild rice or a combination. I also mix in a protein shake here and there and my shakes are almost always the same and I will post the ingredients I use near the end of this write up. I am continuing to check the scale each Monday and in the last couple of weeks I am starting to see a reduction in waist size as well. Below is the tracking chart for weight loss. 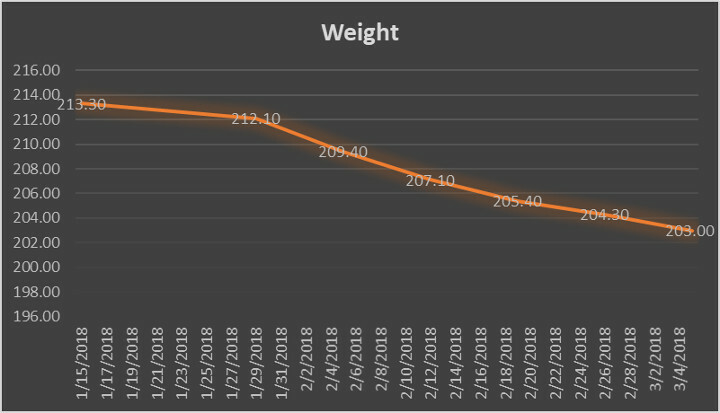 Since I started tracking on January 15th 2018 I have shed 10 pounds total, keep in mind I am not just loosing excess fat but also adding muscle mass at the same time. I am also happy to say that the waistline is also beginning to shrink. 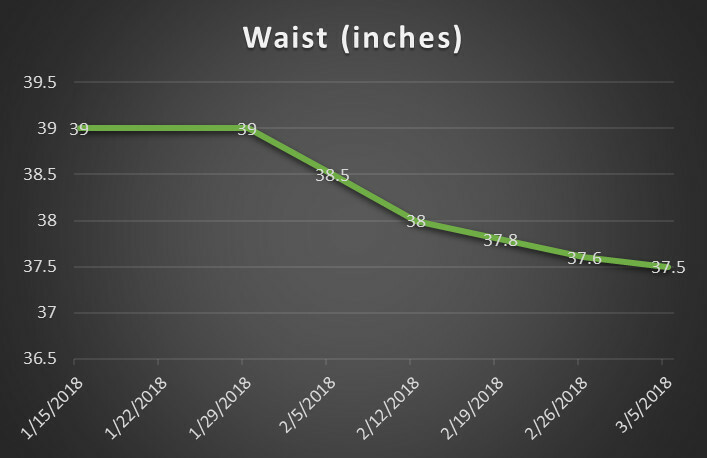 As you can see from the chart below I have managed to take 1.5″ off the waist as well which also feels pretty good. As pertains to my diet I have pretty much covered everything above so I won’t go into any additional details for now…..it is pretty boring anyway to be honest. For Execrcise, I am still following the same basic routine I outlined in the 2 week update post however in total honesty I have missed more days than I would liked due to work and other commitments plus I did spend the better part of a week traveling right after I posted the 2 week update. Hey, we are all human. Bottom line for me regarding this update is that even without extensive exercise I am still losing weight just not at the pace I would like. The next two weeks look better from a time perspective so hopefully I can get back on track, 3 weeks from now I will be hunting for a week in South Carolina so probably another 3 week, maybe a 4 week gap before another update. If you are also working to get into better shape for a hunt or just for better overall health please post your success or experiences by commenting on this post. That’s all for now, look for another update a few weeks from today and in the meantime, if you choose to use this series as encouragement to get yourself in better hunting shape please share your story and your success either by commenting on this post or by contacting us on Social Media. 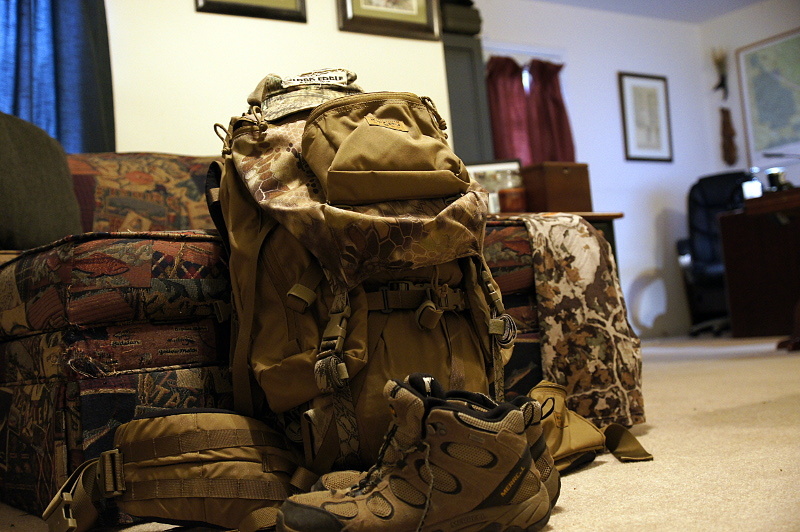 Until then, I am headed out to do a few miles with about 65# before it gets dark…..later.